Both Israelis and Palestinians claim Jerusalem as their capital city. Prominent voices in the Middle East are warning against the U.S. moving its Israeli embassy to Jerusalem, saying the decision could lead to violence and an end to any hopes of negotiations between Palestinians and Israel. 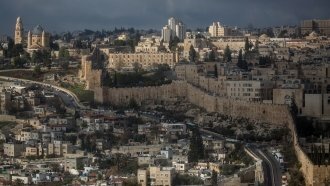 Recent reports say President Donald Trump will recognize Jerusalem as Israel's capital, breaking with decades of international precedent. Previous administrations and other countries retained embassies in Tel Aviv, a way of remaining neutral in the dispute between Israelis and Palestinians over who has the rightful claim to the land. Hamas, the Palestinian Islamic political party with a militant arm of the same name that controls the Gaza Strip, released a statement warning Trump that moving the U.S. Embassy to Jerusalem would lead to violence in the city. Top Palestinian official Saeb Erekat also decried the idea, calling the location of the U.S. Embassy in Israel a "red line" for the region. Earlier this year, a spokesperson for the Kingdom of Jordan said the move would be "catastrophic." Both Israel as well as the Palestinian Liberation Organization claim Jerusalem as their capital. But Israel effectively controls the entire city. The U.S. sees the PLO as the formal representatives of Palestinians. Although reports indicate Trump will recognize Jerusalem as Israel's capital, U.S. officials say the president will delay moving the embassy for a second time since he took office.